THRIVE is a tool which will help each of us find where we "fit together perfectly" in the body, using the gifts, talents, and abilities we have received, "through the generosity of Christ" to help the body of MPC be "healthy and growing and full of love". This helps you see where God has uniquely created you to serve Him. Then serving in this way we can enjoy and be invigorated through serving. The joy of the Lord then becomes our strength. How will we do THRIVE? We have developed a THRIVE "Information Finder" which each person will be invited to fill out and return. (The info provided will be confidential and available only to MPC leadership.) Our MPC Ministry Teams have many ministry opportunities to serve in a wide variety of ways. We will match your indicated interests with the closest Serving Opportunity available. Then we will meet with you and offer you the opportunity to “try the Serving Opportunity, with no strings attached” to make sure it is a position which “puts a round peg in a round hole” so that the whole MPC body is blessed with the results! This "Information Finder" can be completed in paper form by clicking here or by signing into MPC Connect here and filling out the form online. If you would like assistance in completing the form online click here. 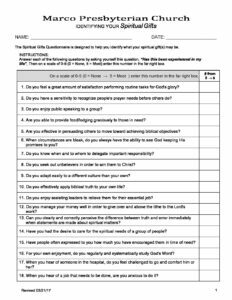 To better understand your spiritual gifts download and complete the Spiritual Gift Questionnaire.